You can't fault Sony for trying. After announcing its renewed focus on mobile back in 2012, the company's consistently issued thoughtful hardware for the global marketplace. But its collective efforts have yet to spark the "emotional" storm company CEO Kaz Hirai seems to be striving for. 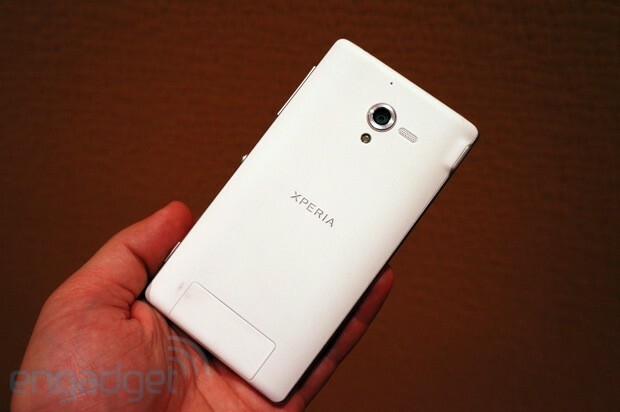 Well, if the smiles on our faces are any indication, Sony may have a bonafide hit on its hands with the Xperia ZL. Introduced officially at its CES 2013 event, the 5-inch Android Jelly Bean handset bears nigh identical specs to its larger, more "premium" big brother: the Xperia Z. With a scratch-resistant 1080p TFT Reality Display powered by Mobile BRAVIA Engine 2, 1.5GHz quad-core Snapdragon S4 Pro and 13-megapixel rear camera with Exmor RS sensor, the ZL sits comfortably in the high-end range. We spent a bit of time exploring the device and gauging its ability to evoke kando -- that Japanese term for an emotional reaction spurred by quality experiences -- so join us after the break to see how it fares and meter our level of excitement. Follow all the latest CES 2013 news at our event hub. We'd seen the leaks, but this may just be a case of pictures not doing the hardware reality justice. Both of Sony's new topflight Xperia handsets are impressively constructed, though the ZL misses out on the Z's "omni-balance" design (read: hard angles and reflective symmetry). To our minds, the Xperia ZL's chassis may actually be the better of the two, what with its soft touch contoured back and gently curved edges that make for an incredibly pleasing in-hand fit. At 5.18 x 2.74 x 0.38 inches, it comes in as shorter than the Z, but that reduced footprint means you're looking at a front face that's about 75-percent display. The ZL also carries a bit more weight than its counterpart at 151 grams, but it's a difference you won't really notice until you're also palming the Z. As Sony is primarily known for its signature design, the ZL doesn't disappoint and is rife with minute accents and flourishes that place an emphasis on premium feel. Take the circular power button that resides in the middle of the phone's right edge. It's the only noticeable hardware element that break up the ZL's profile and Sony wants it that way. Whether or not you're sold on that change, expect to see it on more and more of Sony's handsets going forward in 2013. Additionally, the company's included a dedicated camera key on the ZL -- an obvious focus given the new Exmor RS sensor -- an aspect the Z lacks due to its water- and dust-resistant construction. But perhaps the most notable design decision is the allocation of the 2-megapixel front-facing camera on the phone's lower right -- something we haven't quite seen before, but works well in practice. The ZL incorporates a non-removable 2,370mAh battery, giving it a slight power boost over the 2,330mAh cell allocated to the Z. As for storage, internally it packs 16GB, but you can handily augment that via the microSD slot that's hidden under an admittedly flimsy flap around back (the same place you'll find the micro-SIM). If you've taken any of Sony's latest Xperias for a trial run, you'll be familiar with the light skin atop Android, here at version 4.1.2. Yes, that makes it Jelly Bean and, given the company's track record, the ZL will likely be privy to future updates in a timely manner. In our brief time touring the UI, we didn't notice any damning hiccups that would point towards a lack of software optimization. In fact, the ZL was quite literally snappy -- unsurprising, considering the 1.5GHz quad-core Snapdragon S4 Pro lying beneath its exterior. Out of the box, you'll find three homescreens (customizable via a longpress) and a handful of Sony's media apps like PSMobile, Album, Movies, PlayMemories Online and Walkman. And since the ZL features an IR blaster, users will also be able to take advantage of the pre-installed Remote Control application for use on compatible TVs. Also making the cut are the company's Small Apps, accessible by longpressing on the task manager -- something we'd seen on the Xperia TL. Unfortunately, there is one minor flaw that we couldn't overlook and a surprising one at that. Despite the 1080p TFT Reality Display employed, there's a noticeable washout that occurs when you tilt the device about 15-degrees in any direction. Thankfully, it only reduces the screen's brilliance by a very slight amount and doesn't worsen as you continue to move the device around. We'd have hoped this particular gripe would've been one that Sony could've remedied considering how badly it marred the user experience of the Xperia TL. Since much of the UI experience is the same this time around, Sony's shifted focus to its 13-megapixel camera with Exmor RS sensor. So what innovation does that bring to the table? Try HDR for 1080p video, as well as stills. There's that, Mobile BRAVIA Engine 2 for enhance real-time contrast plus something the company's calling "Superior Auto," which is effectively a smarter automatic setting for the phone's camera. While testing that area of the ZL's software we noticed the camera UI read the framing of our various backdrops and immediately swap to an appropriate setting like sports mode, soft focus for portrait shots or lowlight. This configuration is set to default, so amateur photogs won't have to dig deep into the provided menus. Additionally, the ZL will be able to capture shots in burst mode at 10fps in up to 9-megapixel resolution. And, in case you were wondering, the ZL does support NFC, Bluetooth 4.0 and LTE, as well as UMTS / HSPA+ and GSM. As LTE isn't yet widespread overseas, expect to see a few variants hit the market. Oh and that release date? Well, you'll have to stay tuned for anything more concrete than Q1 2013 -- meaning, we should be seeing the Z and ZL out to market by end of March. Pricing is also an unknown for the moment, but we're sure there are more announcements (likely carrier-related) to come in the near future. 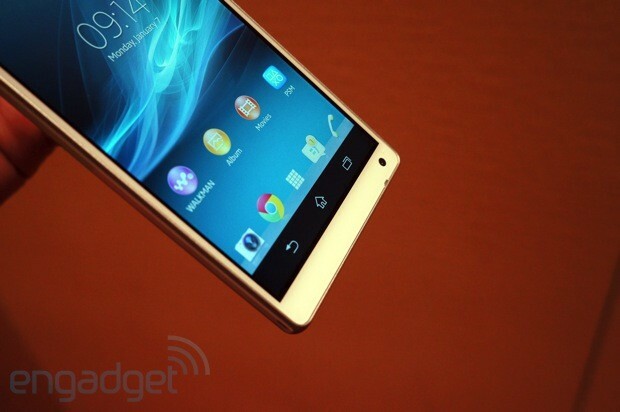 In all, the ZL's shaping up to be a solid effort on Sony's part -- just the type of handset we've been waiting for.